The White Beauty Bar soap is one of the many products of Dove’s Skin Cleansing line. Dove claims this soap will give people softer, smoother, more radiant skin in comparison to any ordinary soap. This soap is mainly used for nourishing dry skin of face, body, and hands and it is advertised to contain ¼ moisturizing cream that helps retain skins moisture. This bar soap has a variety of ingredients listed on Dove’s website, some of them are: Sodium Lauroyl Isethionate, Stearic Acid, Lauric Acid, Sodium Isethionate, Water, Sodium Stearate, Sodium Cocoate Or Sodium Palm Kernelate, and Tetrasodium Etidronate, and is important to mention this soap is not vegan, because it is manufactured from animal fat. Throughout this paper, besides the ingredients, I will examine which are the primary raw materials extracted, the materials added during the manufacturing process, the transportation and packaging materials, and waste materials. Also, I will determine the waste materials and how these materials can be reused or recycled. The goal of this paper is to evaluate the composition of the materials used to make these bar soaps, and how these materials have an environmental impact throughout the different stages of the life-cycle of the soap with a central focus on Materials. Soaps are chemical products called surface-active agents or surfactants, these products are “well-known for their detergency, which is due to a reduction in water surface tension which removes the dirt by wetting, emulsification, lathering, and removal” . The White Beauty Bar Soap is manufactured by the saponification of fats and oils (triglycerides) of vegetable or animal origin and the neutralization of fatty acids, specifically by saponification of palm oil and some animal fat. Starting with the primary raw materials needed for the manufacture of the soap, water is needed as a solvent for dissolving the oxidizer, basically, a solvent is always needed, it can either be milk, water or any liquid containing water, this to mix with the oils and make soap. The water used for the manufacture of soap is extracted naturally in the nearest place from the factory. Vegetable oils and animal fat are other raw materials mentioned in the process of saponification. Animal fat is used to prepared for example Stearic Acid by “treating the animal fat with water at high temperature leading to the hydrolysis of triglycerides” , once you get the stearic acid, this is used as a hardener in soap. Tallow is one of the most crucial animal-based raw material needed to produce soap. Tallow can be found in cattle fat after extraction Tallow is mixed with Lye to create sodium tallowate which is salt of Tallow and it is used for cleansing . Palm oil is a vegetable prominent primary raw material, specifically Palm Kernel oil, this oil is likely that it comes overseas from Malaysia or Indonesia and is manufactured into glycerin in the United States. Palm oil is used to create secondary raw materials like lauric acid which is found naturally in palm oil, the latter is used as a surfactant and cleansing agent . Another example of a palm oil derivate is sodium palmitate, which is a salt made by mixing Palmitic acid and Lye and adding water, this secondary material is used for cleansing and creating lather . Sodium Palm Kernelate is another surfactant derived from combining Palm oil with an oxidizer such as sodium hydroxide. Also, some other vegetable derived raw materials are; Maltol, used as a flavoring agent occurs naturally in some types of plants and is harvested directly; Sodium Cocoate is used as a surfactant, produced by hydrolysis of the ester linkages in the coconut oil with sodium hydroxide . Finally, sodium chloride is the same as ordinary table salt extracted from seawater by evaporating it; this primary raw material is used as a thickening agent . In addition to the primary raw materials used to make soap, some secondary raw materials are added during the manufacturing process; Sodium Lauroyl Isethionate is added as wetting agent and emulsifier ; sodium stearate is added to help keep emulsions from separating into their oil and liquid components ; Tetrasodium etidronate is added during the final stages, this substance is used as a preservative and chelating agent ; and finally Titanium dioxide is added as a whitening agent, which makes the White Beauty Bar Soap its distinctive white color. At the end of the process the soaps are dried and obtained in the form of bars or flakes, depending on the cooling and drying method used, is sent to the finishing line, which gives the soap its final appearance, the soaps are packaged and labeled. Water is needed to use Dove Bar soap, to create foam to apply to skin. Once the bar soap is used it can be re-used several times until the soap is used entirely. Also, there are some other ways to re-use bar soap, for example, people can melt the bar soap or the remainders of it and then add water to create a shampoo-like product. There is no maintenance needed for Dove bar soaps, the customer would need to go purchase more bar soaps once they run out. In addition, glycerin, which is a by-product formed during the manufacturing of soap, can be repurposed, Unilever re-uses glycerin from other products and incorporates it into other Dove products such as shampoo. There are no new materials added to recycle soap because the bar soap cannot be recycled. Although the soap cannot be recycled, the PET plastic wrapper is completely recyclable however the process difficult, and the cardboard container can be recycled as well. The user would just dispose of the packaging in the recycle bin and the plastic components are melted and can be used in other new products. The cardboard container is triturated and mixed with recycled paper, cardboard and other components to create new cardboard that can be repurposed. At the end of the Dove bar soap life-cycle, there are no new materials incorporated for waste management. One last thing to consider of the Soap’s life-cycle would be the water “contaminated” by the soap, which this water would go through the drain and down to a water treatment plant where I presume to use the various chemical to treat the water. Besides the raw materials and their physical characteristics, I understood that Dove’s soap has a considerable impact on the environment, this seeing it from the materials perspective, this soap is not considered vegan nor animal-free testing. To manufacture this soap, it is required palm oil and animal fat which the extraction of these materials generate an environmental hazard. Most of the materials used in soap will end up in the water in sewers which in significant concentrations can damage the water quality. On the other hand, I found necessary to mention that Unilever mission to decrease waste regarding their packaging is working, by making the soap’s packaging completely recyclable. Besides, Dove uses one of the by-products produced during the manufacturing process, by taking glycerin and adding this by-product to another Dove products like shampoo and other detergents. During my research I learned that there are various forms of manufacturing soap, depending on the final characteristics a company may be looking for, they must consider which materials they should use and must understand the logistics of the acquisition of the raw materials and all the complications it involves. I acknowledge the chemical complexity of manufacturing soap, I notice how every ingredient in the White Beauty Bar Soap has a specific reason to be added. I understood in depth the main primary materials used to make this kind of soap specifically, the origin, how they are extracted, when in the process of manufacturing they are added and what are the properties these materials give to soap overall. 1. “White Beauty Bar.” Dove US, www.dove.com/us/en/washing-and-bathing/beauty-bar/white-beauty-bar.html. Soap has been used to maintain personal hygiene as far back in history as the elite upper class of Ancient Rome and Greece, who experimented with different oils to clean their skin. Today, soap making has evolved from these experiments from a handcrafted luxury item into one that is accessible and essential to most of the developed world. Among the many different brands seen in a convenience store, one of the most popular brands of bar soap is by Dove. Founded by the Lever Brothers Co. in 1957, the first product Dove sold was bar soap . Dove is managed by its parent corporation Unilever, who facilitates the manufacturing and shipping of Dove and many other popular brands. The product of interest, Dove bar soap, is made using a lengthy list of synthetic detergents or lyes and oils throughout its production . Although the exact recipe for the production of Dove soap bars remains undisclosed, common large scale manufacturing use a soap-making technique known as the continuous method. This process in its simplest form involves heating the mixture of detergent lyes, salts, and oils, separating byproducts, and cooling the product until it reaches its final state as a bar of soap. This process consumes a wide range of distinct types of energies that the general population has the tendency of overlooking. While the literature on the total and exact energetic costs of Dove soap bars remains largely invisible, some inferences can be made in most areas within Dove’s production process using logic and general known processes for producing soap bars. As environmentally responsible human beings, the best we can do is to research and continue to ask more questions about exactly where and how the common items are produced and what are the different energies are used in the manufacturing a product. Although soap is simple in use, the embedded energetic costs due to its manufacturing and shipping methods are significant. By attempting to trace back the Dove bar through raw material harvesting methods, production processes and shipping methods, the type of energies will become evident to the consumer. For each bar of soap that is produced by Dove, a considerable amount of raw materials need to be harvested. This inherently requires the use of many forms of energy to both extract and transport the materials to a factory where the materials will eventually become the Dove bar soap sold in convenience stores worldwide. While there is a much longer list of complex materials that vary in structure, form, and name, the list can be condensed into a few major raw materials. Alkali detergents chemicals, fats, and oils are essential to the basic process of soap making and each material has its own independent method for harvesting or synthesizing . In a laboratory, the production of synthetic alkali detergents involves chemical reactions that turn simple starting molecules into those making up the necessary detergent chemicals that will eventually be used within Dove bar soap to clean the skin . The chemical processes required demand thermal, kinetic, and electrical energy to facilitate the elementary reactions that make the detergent. These alkali detergents are most likely synthesized and sold to Dove, and therefore needs to be shipped to a Dove factory. By virtue of the geographic area of other raw materials and the “Made in China” label, these detergent chemicals will be produced in a factory in China and shipped via ground-based vehicles. Unilever and Dove have started (as of 2017) to ship using rail methods wherever possible [6,7]. A diesel freight truck (134 miles per gallon) and potentially a freight train (470 miles per gallon) will ship the processed detergent chemicals to a factory also located in China, where it will be further processed . The next raw material that must be acquired and processed through some form of energetic means is animal fat. This fat is used in supplementary chemical reactions in order to produce a salt that is known as sodium tallowate, which is used as a skin moisturizer and requires the use of both thermal, chemical, and electrical energy types . Tallow, which is generally made from the fat of cattle, is then chemically combined with sodium (Na+) to form the salt. Sodium tallowate will have a high probability of being manufactured in China, due to the extensive amount of fat and oil production that is present in the country . With production remaining domestic, this allows sodium tallowate to be shipped through ground-based vehicles, requiring another factor of mechanical and kinetic energy. The last key raw ingredient that needs to be extracted is palm oil. Grown on plantations in the tropical regions of Indonesia and Malaysia, palm trees are harvested for its fruit via farm workers year-round . The fruit is then loaded onto a vehicle to be transported to a separate facility where it can be processed into its conjugate oils. Palm fruits are boiled and pressed resulting in crude palm oil that is then refined and further processed, sold, and shipped to companies such as Dove. In the same Unilever and Dove initiative to switch to rail methods, the companies are also attempting to switch to sea transports when possible in order to reduce emissions . Due to the fact that the palm oil industry is present on tropical islands, it would be most logical to use freight ships to transport palm oil to corresponding Dove factories. From a simple palm fruit to palm oils, this process alone requires an aggregate of energy sources: thermal, kinetic, mechanical, and chemical energies are used in order to bring palm oils to Dove factories. The number of required sources of energy starting at the processing detergent chemicals, animal fats, and palm oils is staggering. The trend of the magnitude of energetic costs only continue to rise moving from the harvesting to the production phase. The large-scale production of bar soap generally involves a process known as the continuous method. As the name suggests, this process is continuous in that it does not stop and therefore consumes massive amounts of energy every second. Large commercial kettles are fed the raw materials mixture of detergent lyes, oils and fats. The mixture is heated and undergoes what is known as the saponification process . The boiling alone may take several days, consuming large amounts of thermal and electrical energy. This results in a concoction that, when cooled and cut into blocks, result in the general form of soap that is seen in bathrooms all over the world. The continuous method, while relatively straightforward, requires an enormous amount of energy, implementing the likes of thermal, mechanical, kinetic, electrical types in order to produce soap bars. The finished product is then packaged, leading to the final major area that Dove soap bars consume energy, the shipping process to distributors all over the world. Unilever, and consequentially Dove, ship their soap bars and other products, using freight trains, trucks, and ships . Depending on the geographic location, distribution plants may reside domestically or internationally. It is possible that only freight trains and trucks will be used. On the other hand, all three methods of shipping and transportation may be necessary to get the bar soap to its final destination. Regardless of the shipping method, there are substantial inputs of thermal, kinetic, and mechanical energy used in order to move bar soaps from factory to distribution. The inferred sum of the energy consumption throughout the entire process is staggering. For such a small and simple object, the implications of this energetic cost have a direct impact on the environment while also possessing underlying ethical and societal consequences. While the energetic costs of a soap bar produced by Dove may seem unimportant to the layman, the magnitude of the energetic costs that were required to produce the bar soap is significant to raise concern. Using what is known from the extraction, production, shipping, and manufacturing process, Dove bar soap spans many energetic types. This results in a huge amount of energy to be used. Although an exact value of energy usage will certainly not be given by Unilever and Dove for its bar soap, it can be reasoned out by virtue of the vast quantity and types of energies that were used. With a strong correlation between an increase usage of energy to an increase in global greenhouse gas emissions that further induces rapid climate change, this should perturb consumers globally. Although it is not feasible to stop production of corporations who make millions of dollars from their products, having more of the general population aware of the energetic costs and its impact on the environment is a major key of success. If enough of the people are aware of the significance by which a simple object such as bar soap has on the environment, it can spur more rapid changes in the methods and energies companies use not just in the production of Dove bar soap, but in every product that is sold in the convenience store. “Dove Beauty Bars Sensitive Skin 2Pk”. EWG’S Skin Deep Cosmetic Database. https://www.ewg.org/skindeep/product/677161/Dove_Beauty_Bars_Sensitive_Skin%2C_2_pk/. “Dove Ingredients Explained”. Albu Skin Care. http://www.alabu.com/dove-ingredients/. Falotico, Laura. “Dove- Brand Evolution”. slideshare.net, 2018, https://www.slideshare.net/laurafalotico/dove-brand-evolution. Accessed 2 Dec 2018. “Fats and Oils Industry Overview”. IHS Markit. November 2018. https://ihsmarkit.com/products/fats-and-oils-industry-chemical-economics-handbook.html. “Fuel efficiency”. CSX. https://www.csx.com/index.cfm/about-us/the-csx-advantage/fuel-efficiency/. Accessed 2 Dec 2018. “Our Greenhouse Gas Footprint”. Unilever. https://www.unilever.com/sustainable-living/reducing-environmental-impact/greenhouse-gases/Our-greenhouse-gas-footprint/. “Reducing Transport Emissions”. Unilever. https://www.unilever.com/sustainable-living/reducing-environmental-impact/greenhouse-gases/reducing-transport-emissions/. “Soap”. How Products are Made. http://www.madehow.com/Volume-2/Soap.html. “Soap Production”. Human Info NGO Education and Development Library. 1995. https://www.csx.com/index.cfm/about-us/the-csx-advantage/fuel-efficiency/. “Soaps and Detergents Book”. Soap and Detergent Association. https://www.cleaninginstitute.org/assets/1/AssetManager/SoapsandDetergentsBook.pdf. “Unilever’s Supply Chain”. Unilever. https://www.unilever.com/Images/unilever-supply-chain-overview---may-2018_tcm244-523172_1_en.pdf. “What is palm oil?”. Green Palm Sustainability. 2016. https://greenpalm.org/about-palm-oil/what-is-palm-oil. The Dove Beauty Bar is a household name which you can find at any grocery store or pharmacy within the United States. It is estimated that 117.19 million Americans used Dove in their daily hygiene practices(Statista). A life cycle analysis is the inspection of a product from the fundamental chemicals that compose of it, to the production process, and finally where it ends up in the world in terms of waste. A profound component of any life cycle analysis is the evaluation of the waste and emissions that a product possesses. This paper will be looking at Dove Beauty Bar’s waste and emissions throughout its entire life cycle and the role the parent company Unilever has in mitigating such potential. The main stages of potential waste the Dove Beauty Bar are from its manufacturing and transportation, consumer recycling and waste water with the product, and the source of the raw materials used in its product. Unilever has made great efforts over the years to reduce their carbon footprint in manufacturing and transportation, however, the source of the raw ingredients used in Dove Beauty Bars pose the greatest environmental threat. Unilever, the parent company of Dove has made great strides in recent years to reduce their carbon footprint in the modern world. They take pride in making their business model as sustainable as possible, “In 2017, our factory sites reduced CO2 emissions from energy by 47% per ton of production compared to 2008(Unilever).” Throughout hours of research there was unfortunately not any more specific statistical information regarding the Dove Beauty Bar alone in regard to factory specific CO2 emission reduction. Unilever owns more than one hundred and sixty brands, and with all of those brands manufacturing unique items themselves it’s impossible to know just how much Dove is doing to reduce its CO2 emissions. When Unilever was contacted directly for more specific information regarding the Dove Beauty Bar they simply replied back with a link to their website with generalized information. There was also no way to find out about any factory specific conditions for the workers or waste water. Unilever has an ambitious mission to become completely carbon positive by 2030. According to their website this means that Unilever will, “Source all our electricity purchased from the grid from renewable sources by 2020, Source 100% of our energy across all our operations from renewable sources by 2030, Eliminate coal from our energy mix by 2020, and directly support the generation of more renewable energy than we consume, making the surplus available to the markets and communities where we operate by 2030(Unilever).” By committing to becoming carbon positive, Unilever will greatly reduce its rate of emissions from its production of products. Renewable energy and the removal of coal powered operations is essential to lowering the levels of carbon emissions from their production factories. The only byproduct that comes from the continuous saponification process is glycerin which Dove more than likely uses in manufacturing other products (Chagrin Valley).” Unilever is making amazing commitments for the future of their production processes and the same could be said of their transportation efforts as well. Unilever doesn’t finish their ambitions at the production level, they know and understand the impact that transportation has on the environment. The threat transportation has on the environment stems from, “burning fossil fuels like gasoline and diesel releases carbon dioxide, a greenhouse gas into the atmosphere. The buildup of carbon dioxide is causing the Earth’s atmosphere to warm, resulting in changed to the climate we are already starting to see today(EPA).” Dove uses big rig trucks, cargo ships, and airplanes to transport their Dove Beauty Bar products worldwide. There is absolutely no way for Dove to not contribute to climate change. So long as there is a demand for their product, they will have to ship it to the consumer and carbon emissions will be present. However, Unilever is aware of the amount of carbon emissions they produce in the sector of transportation and have made efforts to reduce the overall amount in any feasible way that they can. Unfortunately, there is no readily available information on the average amount of carbon dioxide emissions that a shipment of Dove Beauty Bar’s would normally emit. Unilever state on their website that, “since 2010, we’ve achieved a 31% reduction improvement in our CO2 efficiency through reducing the overall number of kilometers travelled, avoiding wasted journeys, and switching to greener transport options(Unilever).” They are making efforts to, “establish the most efficient routes(Unilever),” while simultaneously focusing on, “how we load each lorry, making sure we use the maximum space available and weight allowed(Unilever).” These decisions surely have a substantial impact on the reduction of carbon dioxide emissions as Unilever ships Dove Beauty Bar’s from their factories to retail stores. When the situation allows for it Unilever has also stated that they, “switch from road journeys to rail and sea freight(Unilever),” which results in lower carbon dioxide emissions overall. Unilever will continue its mission to reduce carbon emissions when transporting their Dove Beauty Bar, but the reduction of waste does not solely fall on the producer of the good, but the consumer as well. The consumer of a Dove Beauty Bar plays a role in the mitigation of waste. The first major way in which the consumer contributes to the mitigation is by the means of how they use the product. The average consumer is going to use the Dove Beauty Bar in a shower, a bath, or while washing one’s hands. All three of these methods will have the same destination for the waste water as it goes down the drain in one’s home which is either a septic tank or more commonly a wastewater and sewage treatment plant(Melin). With the focus being on the more common treatment plant the water will first, “go through a primary or mechanical treatment where 60% of suspended solids are removed(Melin).” After the initial step the wastewater goes on to, “a secondary treatment where aerobic bacteria breaks down the soap, detergent…(Melin).” For the final step in the process, “the water goes through a tertiary treatment where it is filtered and disinfected so it can be released back into the environment(Melin).” The Dove Beauty Bar remnants within the water such as sodium tallowate will be broken down by aerobic bacteria in the second phase of the process. With the use of water treatment facilities there is not any major pollutants caused by the Dove Beauty Bar that end up making their way through the entire process which would pose a threat on the environment. However, a study was done to investigate the carbon footprint of waste water treatment facilities and was able to find that they contribute to, “0.45% or the yearly average per capita CO2e emission in Europe (Parravicini, Vanessa, et al).” Although it’s not a substantial number in comparison to what other sector’s carbon footprints are, it is wise to note that waste water treatment plants do in fact contribute to pollution and carbon emissions. The longer one chooses to run water while using Dove Beauty Bar, the greater the amount of waste water the factories will have to process, thus contributing more to overall carbon emissions. The Dove Beauty Bar makes no claims to be completely biodegradable so its advised to not use this product in a natural environment such as a lake or river. One example of a detrimental effect of using a soap in a natural body of water is that, “Lower surface tension of water reduces the oxygen level in the water, causing harm to fish and other aquatic wildlife (Martinko).” The consumer has a role to play in where they use the product as well as how long they use water to aid in their cleansing routine. Another interesting aspect the consumer aids in is the reception of the packaging and how to discard it. The Dove Beauty Bar comes in a small white cardboard box which is recyclable. Having a cardboard box as an option to recycle while being so small is a much better product to deal with than the liquid version of this product which comes in a large plastic bottle. Should the consumer choose to recycle the small cardboard box that the product comes in they would be contributing in waste and pollutions prevention. According to waste management, “Recycling one ton of cardboard saves 390 kWh of energy, saves 1.1 barrels (46 gallons) of oil, and saves 6.6 million Btu’s of energy (Waste Management).” Although the cardboard boxes that encompass the beauty bar is small, every effort towards recycling counts. This is especially true for a household product such as this one. Once the cardboard box is sent to a recycling facility, “the cardboard is baled and sent to a mill, shredded into small pieces, and put into a pulping machine to introduce water/chemicals and break down the cardboard into fibers, rolled and dried, then sent off to make new products(Earth911).” The cardboard packaging of a Dove Beauty Bar can and will be used in future products if the consumer chooses to recycle the packaging. The packaging used is the least detrimental waste factor for this product, but the acquisition of the raw ingredients used in the product contains the most harmful waste and emissions potential. A Dove Beauty Bar contains thirteen ingredients in total. Of the thirteen two are of the upmost importance when speaking of waste and emissions. One of the ingredients is sodium palm kernelate and the other is sodium tallowate. Sodium palm kernelate is the product of the process in which sodium hydroxide is synthesized with palm kernel oil (Tomsofmaine).” Unilever does not state where they source their palm kernelate, but deforestation is a major problem with the ever-increasing demand of the African oil palm tree. Palm plantations are sprouting up at alarming rates across South East Asia, but in order to do so rainforests need to make way. With the destruction of rainforests comes an increase in CO2 emissions and hinder the rainforest’s ability to maintain water recourses (Scientific American).” Although it’s unclear to know exactly how much Dove is contributing to this problem, by having this ingredient there is no workaround in the damages being done. Another harmful product is the use of sodium tallowate in the soap bar. Sodium tallowate is, “fat derived from the fatty tissue of sheep or cattle, sodium, magnesium, and potassium tallowate are the salts of the tallow’s fatty acids (Australian Soap Blog).” By using this product as one of their main ingredients, Dove is contributing to the livestock production crises which, “The United Nations Food and Agriculture Organization estimating that livestock production accounts for about 14.5 percent of all human-caused emissions, or about 7.1 gigatons of carbon dioxide or its warming equivalent (Inside Climate News).” Since Dove is a massive company it’s safe to assume that they most likely receive shipments of animal fat from giant factory farms. The use of sodium tallowate and sodium palm kernelate in Dove Soap is detrimental to the environment currently and will only get exponentially worse over the years. 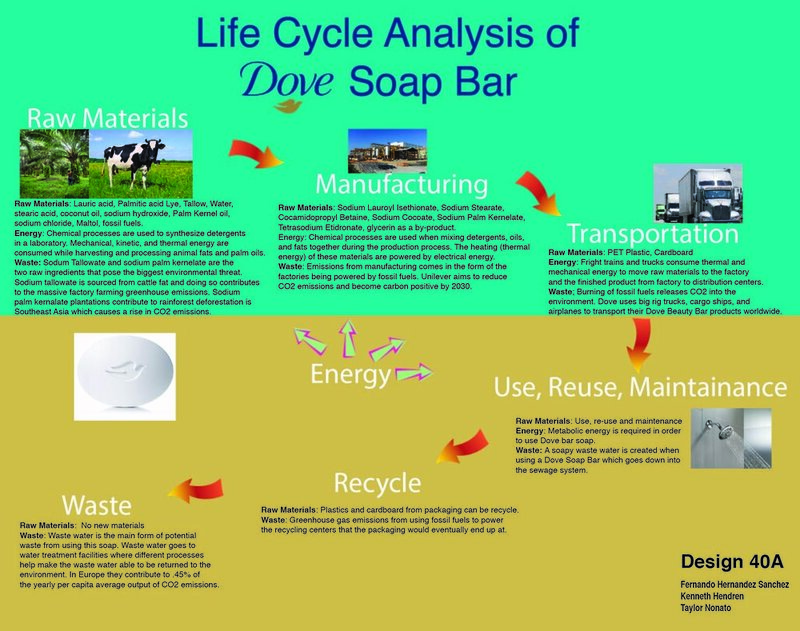 The waste portion of the life cycle analysis of The Dove Beauty Bar answers a lot of questions but seems to only entice more questions to be asked. This is mainly due to Dove not having more specific information readily available online or per request to do a more well-rounded analysis. The consumer has a role to play in how the life cycle pans out by deciding how much water to use or whether or not to recycle the cardboard packaging. Unilever currently has plans to reduce CO2 emissions in its production of products as well as being carbon positive by 2030. Since 2010 Unilever has improved 31% in the rate in which its releasing CO2 by means of transportation. Despite these positives, since Dove uses sodium palm kernelate and sodium tallowate as ingredients, there is a certain threshold of waste and emissions that will always be negatively contributing to environmental problems. This portion of the life cycle analysis of Dove Beauty Bar was beneficial but further research should be done if more specific information to the product becomes readily available. Plants.” Energy Procedia, vol. 97, 2016, pp. 246–253., doi:10.1016/j.egypro.2016.10.067. Skin.” Australian Natural Soap Blog, 13 Sept. 2016, australiansoapblog.wordpress.com/2016/09/15/learn-about-sodium-tallowate-before-using-it-on-your-skin/. Officials.” InsideClimate News, InsideClimate News, 22 Mar. 2018, insideclimatenews.org/news/22052017/factory-farms-cafos-threaten-climate-change-world-heath-organization.